They number in the thousands now, mostly college kids and young adults. They’ve occupied prime public downtown spaces. They’re marching, holding up signs for the cameras, handing out literature, making and listening to speeches. Drumming and chanting, heard for blocks around, is perpetual background noise. A sea of blue plastic tarps dot the area, covering mattresses, sleeping bags and the meager possessions of protesters in what has become something of a tent city. The dissidents have moved in. The police have already used pepper spray, batons and made hundreds of arrests. The nation’s leaders, and those who aspire to high office, are now being forced now to weigh in. The whole world is watching, and waiting. There is no way of knowing when, or perhaps more troublingly, how this will all end. But this isn’t Cairo or Tunis, where earlier this year mass protests ignited the “Arab Spring” and the Tunisian and Egyptian people overthrew dictators in a matter of (semi) peaceful weeks. This is Liberty Square in downtown Manhattan, the center of American finance. The movement is “Occupy Wall Street.” The sound bite is “we are the 99%.” The demands are … unclear. But the demonstration grew and matured over three weeks, and is now spreading to other cities, even overseas. There is talk of an “Occupy the FED” demonstration — and the similarities earlier Middle East uprisings don’t end there: Many got the word to join the protest via social media, and organizers are maintaining momentum and keeping tabs on things the same way. “We get 20 tweets every 10-15 seconds, so it’s hard to keep up. You aren’t even finished reading the 20 and you get 20 more and it just keeps going. This is how it’s been for 18 days,” Eric Gibbs, one of the volunteers manning what appeared to be the command center of the movement, told Wired.com when we visited this week. “What impresses me about media coverage of #occupywallstreet is how inattentive it is to a sleeping factor: the social media ignition moment,” said one of those tweets, from New York University journalism professor and social media watcher Jay Rosen. It’s impossible not to make the Arab Spring analogy, especially when the organization’s own site openly encourages a favorable comparison. “We are using the revolutionary Arab Spring tactic to achieve our ends and encourage the use of nonviolence to maximize the safety of all participants,” reads the site. And, of course the words “Arab Spring” link to the Wikipedia page, in case you missed all that earlier this year. Like the Spring, there is no charismatic leader, a sound bite and a plurality of populist voices. This was successful and North Africa and is proving successful here. Gibbs stands in front of four computers pushed together on a card table, all equipped with web cams and with Livestream and Twitter pages open on three of the four. The fourth was being used to write a speech for the march. From below yet another tarp comes the buzz of generator, powering this DIY tech-hub, but it is kept from sight due to police prohibition. Gibbs easily confesses his inexperience in political activism, but believes that most people here are like himself, called to action via the internet. In his case, this was via occupywallst.org’s chat room, where he found himself in a room of foreigners who wanted to know what was going on. They told him to get downtown. Gibbs opened a Twitter account on day one of the occupation, and re-posted #OccupyWallStreet’s activity into the chat. Now, at day 20, he is one of the many voices coming from Liberty Square, keeping the world informed, play-by-play. 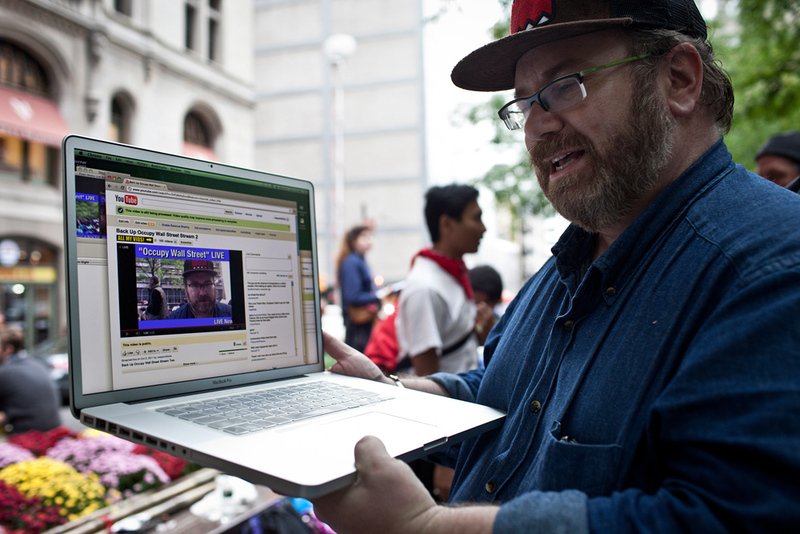 It’s hard to hear him over the din of what might be called the embodiment of their social media strategy: A comrade is shouting into his computer, answering questions from the Livestream chat room run from the Occupy Wall Street site. His pace is rapid-fire and his responses are passionate. This is really how the world is watching: On the marches, they bring these computers, USB hot-spots plugged in, and show the world what is happening, as it happens. “Before we didn’t even have the webcams, we were just marching around with the computer facing the crowd, it was kind of weird,” Gibbs laughed. Twitter and Facebook proved to be, and continue to be, a way to move information quickly, personally, and largely under the radar. Feeds and pages have materialized all over the country in solidarity of the OWS movement, each group now reaching a different, more localized audience. “It’s much more diffuse and potent, and can be spread faster,” said Mark Bray, a volunteer who was standing under a cardboard sign with the word “press” scrawled onto it. “People can get the information without having to go out of their way. You can bump into it on Facebook without having to go to a specific website. In my experience, in just a short period of time its really changed things and brought this whole thing a lot more life.” This is certainly true, and like the movements they seek to emulate, social media’s coverage of the protests and the arrests has uncovered a latent anger felt by many in the country who never thought to object until they saw others who held similar beliefs. What doesn’t necessarily connect are the goals. The press is having a much harder time interpreting Occupy Wall Street than it did with the movements in Tunisia and Egypt. One reason for this is because this time the narrative is unclear. In the Arab Spring the goal was clear: Overthrow dictatorships that had been in place for decades. How does one stop corporate greed in the United States, exactly? But if the outcome isn’t clear — to anyone — the tipping point of frustration seems easy enough to pinpoint. “It’s capitalism for us, and socialism for the capitalists, I think is a fair way to describe it,” Michael Lewis, financial reporter and author of Boomerang, told CBS Sunday Morning.